Project Information : Old Town Temecula Main Street Bridge, Temecula, CA. When the City of Temecula, CA. 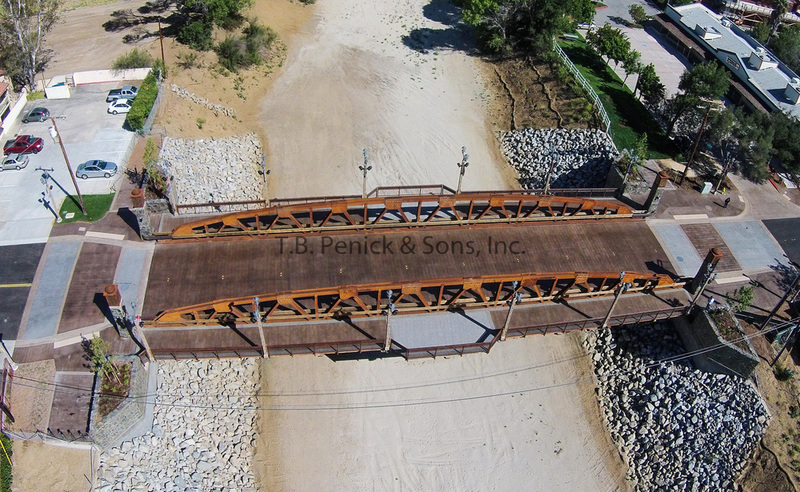 wanted to create their new Main Street Bridge they reached out to T. B. Penick & Sons, Inc. to assist them in constructing a bridge that was both functional and would increase the decorative enhancement to the old town feel. 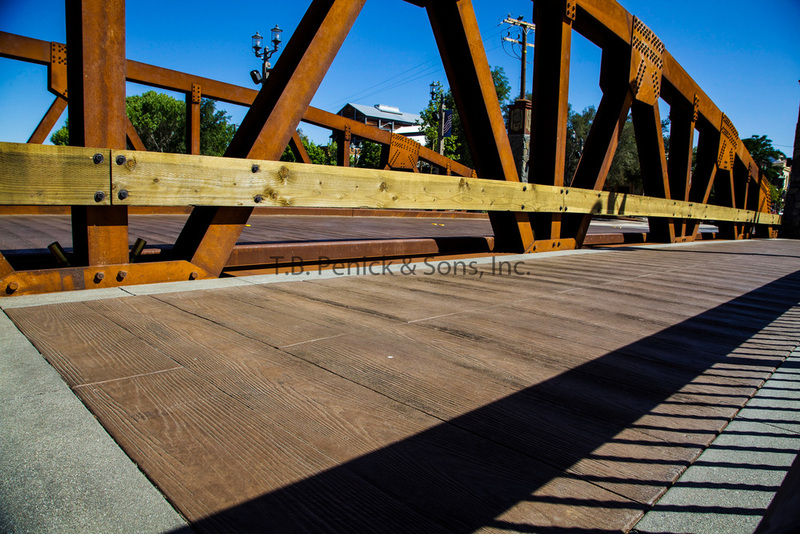 The bridge is located in Old Town Temecula, where today there are still real wood walkways throughout the town. The City wanted the bridge to look like it belonged with the theme of the surrounding area. In addition to the style of the bridge they wanted to create a safer walking space for pedestrians, since this is a high traffic area by adding 10 foot sidewalks along each side of the bridge. TBP was awarded this project because we were able to adhere to the design that the city wanted. They wanted to continue the look of and feel of real wood throughout the bridge. We were able to achieve this by utilizing various lengths of Bomanite’s Boardwalk pattern as well as Bomanite’s Ashlar Slate Bomacron pattern. The bridge was poured over a steel truss structure that required two large pours at 8” thick. The adjacent sidewalks required 2 pours at 4” thick and the adjacent flatwork leading up to the bridge was poured in multiple pours. The overall bridge is 152 feet long and 47 feet wide including 2-10 foot exterior sidewalks. 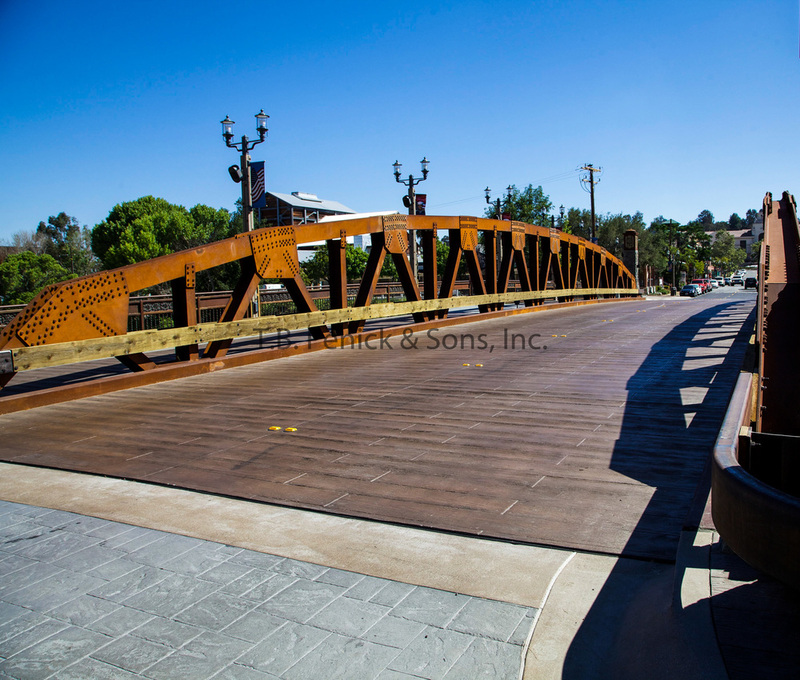 The bridge now looks like it belongs in old town Temecula and is in use today.